A few readers have written to ask me about the question I keep discussing when talking about LINQ. I use the idea of a question in both LINQ for Dummies and Start Here! Learn Microsoft Visual C# 2010 Programming to describe the concept behind LINQ. In fact, if you have problems understanding this concept, you’re not alone. Many people have trouble understanding just how it is that declarative languages such as LINQ and SQL perform their job. The idea that you can describe what you want and let the computer decide how to do it is foreign to many people because most people rely on procedures to understand many issues. LINQ and SQL don’t offer procedures. At the root of the problem is the word “how.” We want to know how things work and how to do things. Imagine for a moment that someone tells you to go to 123 Anywhere Street and pick up a widget for them from the grocery store. They don’t tell you how to get to 123 Anywhere Street or anything else about the request—they simply assume that you’ll figure it out on your own. Most people would eventually get a map, work out a route, and get to 123 Anywhere Street. Once there, they’d go to the grocery store and ask for a widget from the owner. This sequence of events is akin to what is happening with both LINQ and SQL. You tell the computer to get the widget from the grocery store at 123 Anywhere Street. The “how” is unimportant and you truly don’t care how the computer accomplishes the task. So, where does the question part of this discussion come into play? Developers want data to manipulate within their applications, not widgets. When a developer requests data from the computer using a language such a LINQ, the developer does so in the form of a question or a query. In fact, declarative languages often use the word query as part of their nomenclature: Language INtegrated Query (LINQ) and Structured Query Language (SQL). These languages specialize in asking questions and telling the computer to use any means necessary to answer them. The developer doesn’t care how the language does its work—all the developer cares about is the data. Declarative languages free the developer from having to think about how to perform tasks. A developer can spend more time thinking about data manipulations and less time thinking about the mechanics of language. This means that the developer can become a lot more productive and write applications significantly faster. The use of declarative languages also makes application development easier. A less skilled developer can write a more complex application. Don’t get the idea that LINQ is a wimpy language that limits what you can do in the interest of simplicity. In fact, LINQ users can create extremely complex scenarios that would require considerable time to figure out without LINQ. For example, I wrote an article about using LINQ Extensions some type past. You’ll want to review this article if you need to see one of the more technical ways to use LINQ (and even this article doesn’t discuss the topic in depth). While you’re at it, check my other articles on using LINQ Expression Trees and using LINQ with Resource Description Framework (RDF) files. The bottom line is that LINQ is about queries, or questions. You ask the computer to supply data based on some criteria. The computer decides how best to obtain the data for you, so you can concentrate on issues that the computer can’t decide, such as data manipulation and presentation. If you have additional questions about why someone would use LINQ or why I explain LINQ as answering questions, please let me know at John@JohnMuellerBooks.com. Almost every book I write on programming has some element of application design in it. If you don’t create applications with a great design, users are less likely to use them. I examine general design issues in C# Design and Development. However, books like C++ All-In-One Desk Reference For Dummies, LINQ for Dummies, Professional IronPython, Start Here! Learn Microsoft Visual C# 2010 Programming, and Web Matrix Developer’s Guide all have design elements in them because I feel application design is extremely important. Even RibbonX for Dummies and VBA for Dummies have design discussions in them because they both talk about user interfaces. The most specialized book I’ve created about application design is Accessibility for Everybody: Understanding the Section 508 Accessibility Requirements, which discusses user interface requirements for those with special needs. All of these books have one thing in common, they all try to quantify what makes for good user design. They all ask the question, “How can you as a developer write an application that users will enjoy using and use efficiently?” Unfortunately, examples of poor design abound and seem to be more common as time goes on, which is the point of this post. 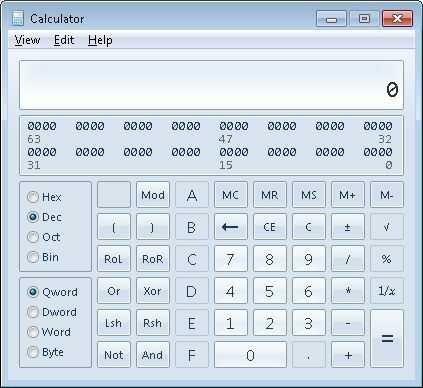 The Calculator application in Windows 7 is a perfect example of an application that has gone the wrong direction when it comes to the user interface. Sure, the Standard view is the same in both cases as shown here. The Windows 95 version of Calculator is on the left and the Windows 7 version is on the right. As you can see, the buttons are the same, but someone at Microsoft felt obliged to rearrange them, just to make things difficult for anyone used to using the old version of Calculator. There isn’t a good reason for the change except to change for change’s sake. The Windows 7 version does have larger numbers, but at the expense of providing room for larger calculations. Personally, I’d prefer the Windows 95 version because sometimes I do need to perform really large calculations. Both versions of Calculator offer features such as digit grouping, so there isn’t any change here either. In short, Windows 7 offers less capability in a rearranged format that makes it hard for people who are used to the old version of Calculator to use it—breaking the rules of good design. The problems get worse, unfortunately. I never used the Standard view of Calculator because I need to perform programmer math and scientific calculations relatively often. 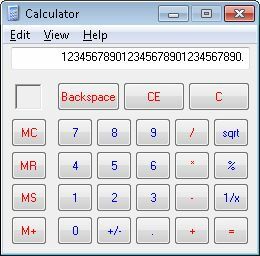 Switching to Scientific view in the Windows 95 version of Calculator, you see the perfect interface as shown here. During the time I worked with Windows 95, I never switched out of this view. All I did was start Calculator whenever I needed it and did the math that I needed to do. Never once did the view I was in enter my mind. That’s great design! Users shouldn’t have to think about how your application works—the user’s only thought should be how to get work done. 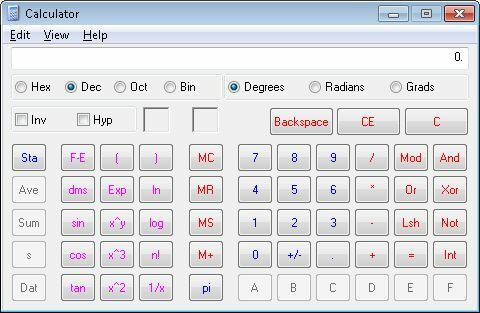 The Windows 7 version of Calculator now has four modes: Standard, Scientific, Programmer, and Statistics. Every time I use Calculator now, I must first figure out what I want to do and change the view appropriately—wasting time and effort in the process. The views unnecessarily limit my options. For example, look at the Programmer view. I do gain access to the RoL (rotate left) and RoR (rotate right) buttons, but I can’t think of when I’ll need them. The modern languages that most developers use don’t actually require these buttons. If I were using assembler, they could see some use, but I don’t remember ever using rotate left or rotate right with C#, Visual Basic (any version), Python, or even C++. So, these buttons are extraneous and only serve to complicate the interface. In addition, I do gain a bit display, which could prove helpful at some point, but I found that the Bin view on the old version of Calculator worked just fine and served my needs well. However, notice that the decimal point button is disabled. The loss of this button means that every time I have to perform any sort of math with a decimal point, I have to switch to another view. Programmers do use floating point numbers! So, a capable programmer calculator has been replaced with something less useful—something that makes me irritable and work harder. Now let’s switch to Scientific view. Remember, I used to be able to do everything in one view. If I want to raise a value to a power now as part of checking application output, I have to switch to the Scientific view shown here. As usual, someone felt that it was absolutely required to move the buttons around so that it takes a while to relearn how to use this view. For the most part, I don’t use any of the new features provided by this view. The few times I needed to use this feature with the old Calculator required a switch to Standard view, but the switches were seldom indeed. The Scientific view does include a number of additional features, all of which are likely helpful to someone, but the cost is one of having to switch views when you need to do something else. 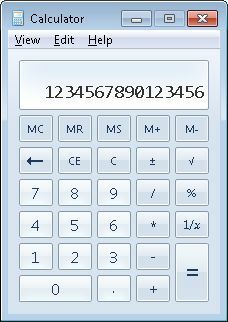 Before someone writes to tell me that the new calculator has square root, cubed root, and root to any power buttons, the Windows 95 Calculator has these features as well. You just had to know how to use a calculator to understand them. Let’s say you want to find the cubed root of 27 using the Windows 95 Calculator. Simply type 27, check Inv, and click the x^3 button. You’ll see the cubed root answer of 3. Not convinced? OK, let’s try a quad root. Type 16, check Inv, and click the x^y button. Now, type 4 (the quad root) and press the = button. You’ll see the quad root of 16 is 2, which is the correct answer. The Windows 7 calculator adds nothing new in this regard—just more buttons to hunt and peck! In short, the new Calculator is an example of a failed interface update. Most people will find that they have to constantly switch between views to get anything done. When you force people to think too much about the interface, they tend to get grumpy, less productive, and end up tossing out the application at some point. 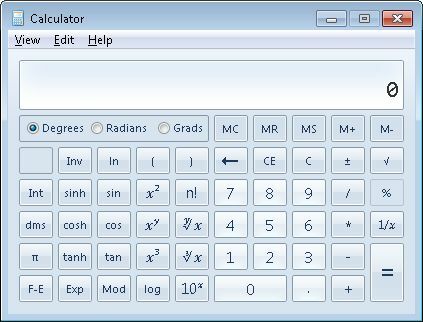 Personally, every since I found the Windows 95 version of Calculator runs just fine on my Windows 7 system, I’ve been using it instead of the broken product Microsoft has offered. The Windows 95 version truly is the superior application. Let me know your thoughts on Calculator and on application design in general at John@JohnMuellerBooks.com. For many people, this time of the year is extremely depressing. There are all sorts of acronyms associated with this time of the year, such as Seasonal Affective Disorder (SAD). I have no doubt that these disorders, diseases, and disabilities all exist and are quantifiable in some way. In fact, I imagine that there are tests to determine precisely which of them you have and to what extent you suffer from them. The bottom line is that the holidays are over, the weather is stormy, and the budget tight. Excitement is nowhere to be found—at least, not the sort of excitement that many people consider fun today. It’s this time of year when Rebecca and I engage most strongly in crafting. Making things tends to take your mind off of all of the things that would make you SAD. For example, this is the time of year that I make knitted items most. A craft need not be expensive or require skills that most people lack. I’ve known more than a few families who have gathered pine cones in the fall, drizzled a bit of glue on them, dipped them in glitter, and added a bit of yarn to string the pine cones up. Not only do them make attractive Christmas ornaments, you can hang them up in a room as decoration. The cheerful colors and the occasional glint of the sun dancing off the glitter can dispel the gloom in any room. Stenciling and other forms of decorative art are helpful this time of the year as well. I got the idea for bright colors in a room from some of the displays in European Village at the Milwaukee Public Museum. Old world houses weren’t drab—they were colorful to keep things cheery during the winter months. This form of decoration improves your ability to withstand the drab winter months and could very well help keep SAD at bay. The best part of all is that you can get the supplies for any of the crafts I’ve mentioned for less than $20.00 and some, like stenciling, can consume an inordinate amount of time that you’d otherwise spend feeling bad. Of course, not everyone likes crafts and I wouldn’t want you to saddle yourself with something that you won’t ever enjoy (no matter how hard you try). This is also a good time of the year to take a winter walk. Wait for a nice day and go into the woods. The woods are amazing this time of the year and if you’re careful, you’ll see some interesting animals, such as a fox or weasel. You have to look extra hard in some cases. Some animals change color in the winter to better blend in with their environment. A white rabbit on white snow is incredibly hard to see. Create a list of the action heroes that appear in your movie collection (or that you know you can borrow free from somewhere like the library). Place the names in a hat and have someone draw four or five names. Create lists of the movies that you own for each action hero. Place the movies for a specific hero in the hat and draw out the name of a movie for that hero. Create movie lists and draw a movie name for each of the remaining heroes. Now that you have a list of names and movies, create a scorecard. It doesn’t have to be anything fancy, but each member of the family who participates in Super Action Hero Bowl should have a separate scorecard. Continue watching movies until you have completed them all. Tally the scores from each of the scorecards for each movie. The movie with the lowest score (the highest rank) wins. It’s a good way to spend a day in family fun. It’s inexpensive and the competition adds a certain appeal to the event. Of course, just like the Superbowl, you can grab some special foods from your larder and serve them during the course of the day. Just because the holidays are over, doesn’t mean you have to make things drab. Rebecca and i usually store some special goodies in the larder for this time of the year. When there is something to celebrate, we make an impromptu personal party using these items. We’ll play games, listen to special music, put puzzles together, or do other things to make the event special. Get a good report from the doctor? Why not have a party to celebrate it? It takes a little effort to avert the drudgery of this time of the year, but you can do it and it doesn’t have to cost a lot (or anything at all). How do you avoid the January blues? Do you like crafts, a bit of nature, some mild competitive fun, or a bit of a party? Let me know at John@JohnMuellerBooks.com. Make sure you also view the other Fun is Where You Find It posts for other ideas. I’m always looking for better ways to present an idea or concept in my books. Sometimes a chapter will change quite a few times and I might even make last minute changes, just to ensure that the chapter provides the best information possible. Unfortunately, those last minute changes can cause problems, as has happened with the Get Going with C# section in Chapter 3 of Start Here! Learn Microsoft Visual C# 2010 Programming. A reader wrote me about being confused after reading a chapter that discusses TextBox controls and then being told that the chapter actually discusses the ListBox control. I originally started writing the example in Chapter 3 using two ListBox controls. However, the coding concepts that I wanted to demonstrate were made harder by the use of these controls. So, I instead chose to use two TextBox controls with the Multiline property set to True. The effect looks much the same, but the features of the two controls are different and using the TextBox controls made things simpler for the reader. As far as I’m concerned, making things simple is always better than getting too fancy. There are, in fact, five examples in this chapter named ListProject1 through ListProject5 and they all use TextBox controls in the interest of simplicity. Because the focus of this chapter is on LINQ and not on the ListBox control, there really isn’t a problem in using something that looks like it could be a ListBox, but is really a TextBox. If anything, it demonstrates that you can obtain similar results using several different approaches in C#, which is always good to know. Even so, this is another demonstration that errors do occur in book (as stated in my Errors in Writing post). The examples all work as stated and you’ll still learn about working with LINQ. The chapter is complete, despite the feeling that there is something missing when you see that summary. The only difference is that you need to substitute TextBox for ListBox in the Get Going with C# section of the chapter. Please let me know if you encounter any other errors in the book and I’ll be sure to mention them here. In the meantime, please contact me at John@JohnMuellerBooks.com if you have any questions or concerns about this book. I’ll be happy to help you in any way I can . One of my goals when I wrote Start Here! Learn Microsoft Visual C# 2010 Programming was to provide a simple environment in which to learn C# programming techniques. Many books make the process hard or spend a lot of time with theory before you even get to write any code. In this book, you start creating applications almost immediately. Because most people reading this book would rather not spend a lot of money, I chose to use Visual C# Express. Since then, I’ve had a number of people write to ask me about using Visual Studio 2010 instead. The short answer is that you can most definitely use Visual Studio 2010 with this book. However, it’s important to remember that the book is written using Visual C# 2010 Express. That means you’ll need to make a few adjustments, even though I did make an effort to create generic content that would work in a number of situations (in some cases, even with older versions of Visual C# Express). If you choose to use the book with a version of C# other than the one found in Visual C# Express 2010, you’ll probably see these differences. The screenshots won’t match precisely. This is probably the most noticeable difference because every version of the C# IDE looks just a little different. When you work with a product other than Visual C# 2010 Express, you’ll need to look for screens that are similar, but not precisely the same as those you see in the book. Some procedures won’t work quite the same. I’ve tried to do things like use the New Project link on the Start tab, rather than menu entries whenever possible. Both Visual C# 2010 Express and Visual Studio 2010 have the same link (in almost precisely the same position). However, there are situations where I must use menus and in that case, you’ll likely see differences. For example, Visual Studio has a File > New > Project menu entry (three levels), while Visual C# Express uses File > New Project (two levels). Differences like these could confuse some less experienced readers. A few features could be missing. If you try to use this book with Visual C# 2008 Express or some other older version, you may find that it lacks some of the features I describe. When this happens, you need to work around the issue as best as you can. Unfortunately, the lack of feature support means that you might not be able to work with all of the examples. I’m here to help you as much as I possibly can. Unfortunately, no matter how many computers I buy and load with software, there is a good chance that I won’t be able to match your setup precisely. We may have to exchange a few e-mails before I can locate the source of a problem that you’re experiencing. Always feel free to contact me about your book issues at John@JohnMuellerBooks.com, but once you do, please be patient as we through through any issues together. You don’t have to wait until you have a problem to contact me. If you have anything to say about the book, positive or negative, I’d love to hear from you. Don’t forget to review my book on Amazon after you’ve finished. Your reviews will help other people make good buying decisions. As always, thank you for your support ! On page 74 of Windows Command-Line Administration Instant Reference, I describe how to add an Open command to an existing file type, txtfile. The txtfile type already appears in the registry, so adding a new command to it is relatively straightforward. However, what happens if you want to create an entirely new type—one that doesn’t currently exist in the Registry? Before you can do anything, you need to open an Administrator command prompt because Vista, Windows 7, and anything else newer won’t let you make the required registry changes with a standard account. Follow these steps in order to open an administrator command prompt. 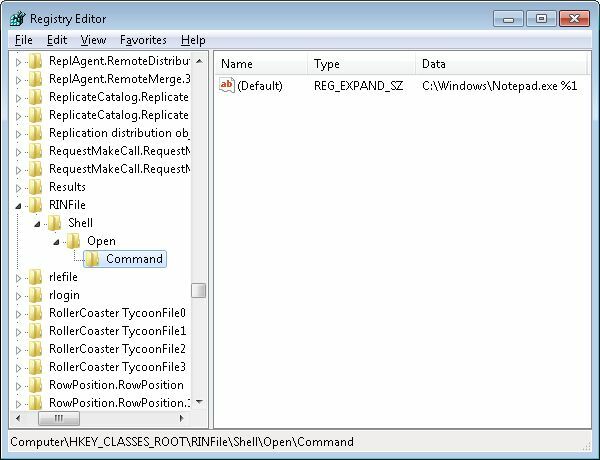 Right click the Command Prompt icon and choose Run As Administrator from the context menu. You’ll see a User Account Control dialog box. Click Yes. You’ll see a new command prompt open. However, instead of the usual title bar entry, you’ll see Administrator: Command Prompt. In addition, instead of opening to your personal user folder, the prompt will display C:\Windows\system32>. If you don’t see these differences, then you haven’t opened an administrator command prompt. Let’s say you want to include a new file extension and it’s associated type. 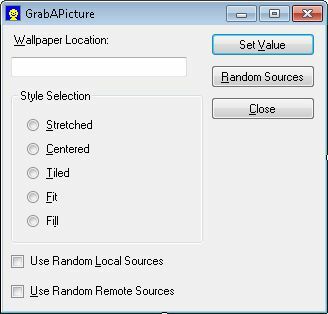 For example, you might want to create a .RIN file extension and associate it with a type of RINFile. Once you create this association, you may want to use Notepad to open the file. In order to perform this task, you need to use two different utilities as shown in the following steps. Type Assoc .RIN=RINFile and press Enter. You’ll see, “.RIN=RINFile” appear at the command line. 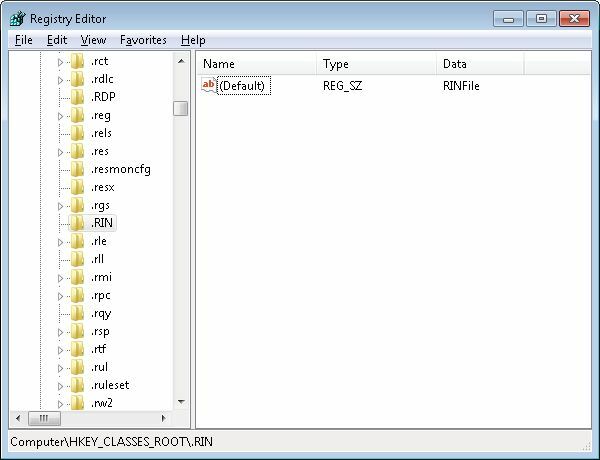 This command creates a .RIN file extension entry in the Registry as shown here. 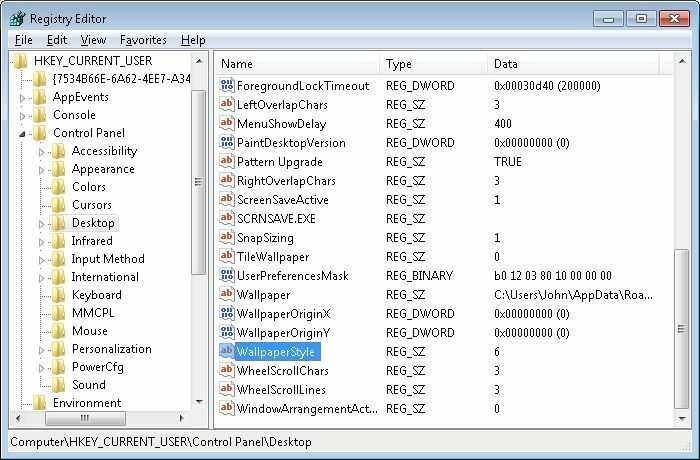 Type FType RINFile=%SystemRoot%\Notepad.exe %1 and press Enter. Notice that you don’t enclose the command in double quotes—it will fail if you do. You’ll see, “RINFile=C:\Windows\Notepad.exe %1” (or something similar) appear at the command line. This command creates the RINFile association in the Registry as shown here. Create a new .RIN file on your hard drive. You don’t have to do anything with it, just create the file. Double click the new .RIN file. Windows will open the file using Notepad. 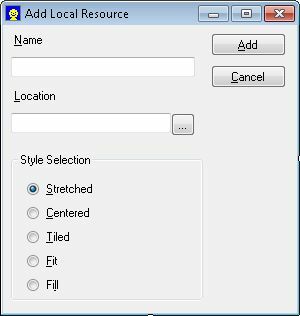 This technique works with any file extension and association you want to create. In fact, you could easily create a batch file to patch user configurations where the file associations have become damaged in some way. The big thing to remember is that this is always a two-step process when the file extension doesn’t already exist or the association is new. Use the Assoc utility to create a link between any file extension and it’s association and the FType utility to create the association itself. Let me know if you have any questions about this technique at John@JohnMuellerBooks.com. Part 8 of this series of posts says that I’ve tested the book’s code with a combination of CodeBlocks 10.05 and Boost 1.47.0. Since that time, the makers of Boost have come out with another version of the product and a few readers have questioned me about it. I’ve verified that the compiler does in fact work with Boost 1.48.0 as well. So, you can use CodeBlocks 10.05 and Boost 1.48.0 together. That said, some of the procedures found in the book for performing tasks such as building the tools are unlikely to work without modification. For example, on page 679 I tell you how to build Boost Jam. This tool no longer exists in 1.48.0, so naturally that directory is missing and the procedure won’t work. If you plan to use Boost 1.48.0, you’ll need to modify the procedures in the book to match your setup. I’ll rewrite these procedures to work with the latest version of the software during the next book update. There is one important change you need to know about in order to successfully build the applications using Boost 1.48.0. Look on page 693 and you see a procedure for adding the Boost directory to the search directories list. You must change the directory to match the installation directory for Boost 1.48.0. The book assumes you’re using Boost 1.39.0 and uses that directory in the procedure. Other than this change, the example should work just fine. If anyone does run across a problem using Boost 1.48.0, I’d love to know about it. Please contact me at John@JohnMuellerBooks.com with details about the problem you’re having and I’ll do my best to solve it.